When a senior lives with heartburn, over-the-counter medications won’t always help. Fortunately, Oshkosh senior care providers can resort to more natural methods to help their loved one relieve heartburn pain and discomfort. 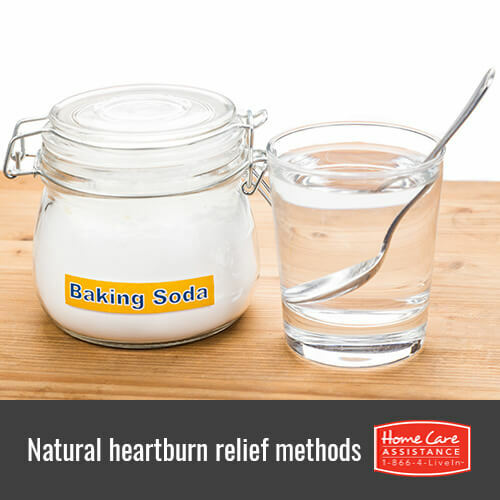 Sodium bicarbonate, more commonly known as baking soda, is a time-tested solution for heartburn that is both gentle and fast acting. As seniors need to be more concerned with side effects from medication or over-the-counter remedies, a simple solution of water and baking soda neutralizes antacid with no adverse effects to the rest of the system. A widely popular plant for skin health and burn treatment, aloe vera is an excellent anti-inflammatory that quickly reduces stomach inflammation and helps the body heal from prior acid damage. Like baking soda, aloe vera has little to no adverse effects, so it can be safely taken by seniors without risk of side effects. In addition, aloe juice is great for digestion and the regulation of blood sugar by promoting insulin sensitivity. Mint is great for settling stomachs, neutralizing acids, and soothing indigestion. Mint tea is a wonderful way to help seniors deal with current heartburn, but it can also prevent future cases as it slows production of stomach acid. Best of all, mint tea can be served hot or chilled to suit your loved one’s tastes. Chewing fennel seeds is an old breath freshening technique, but compounds in the seeds themselves help relax the stomach after a meal by reducing the amount of stomach acid released and preemptively reducing heartburn effects. For best results, the seeds should be chewed for at least 30 minutes prior to eating. Periodically chewing them throughout the day is a great way to keep stomach acid at bay. Ginger is easily eaten raw, though seniors may prefer it in a tea with honey, a doubly soothing beverage that helps with other ailments aside from heartburn. Heartburn can make life challenging for seniors, especially when they live with other health problems. Should your loved one require a helping hand managing an illness, reach out to Home Care Assistance. In addition to helping seniors around the house with chores, meal preparation, and errands, we also provide illness-specific services such as Alzheimer’s, stroke, and dementia care in Oshkosh. Contact us at (920) 710-2273 today to learn more about our services and schedule a complimentary in-home consultation.